Hawkdun Lodge has a range of guest facilities and services to ensure your stay is as comfortable as possible. We have an indoor spa pool, laundry, secure bike storage room, communal kitchen and lounge, BBQ and wi fi. These facilities and services are all complimentary. For those who want to relax and stay put rather than going out in the evening we have a full kitchen and lounge for you to make your own meal or enjoy one of our dining options. The kitchen has an oven, cook top, microwave, large fridge, dishwasher, pots, pans, crockery and cutlery. A BBQ is conveniently located nearby. There are tables and chairs for dining indoors or a large outdoor table adjacent to the Hawkdun Room. The room has comfortable sofas and chairs for socialising, a 42” wall mounted TV, a DVD, games, books and magazines. For comfort the room has a gas fire and two heat pumps for heating or cooling as required. The Hawkdun Room has a patio and catches the afternoon sun. It has views across the Maniototo countryside and is a great place to watch the sun set. Each morning continental breakfast is served in the Hawkdun Room. 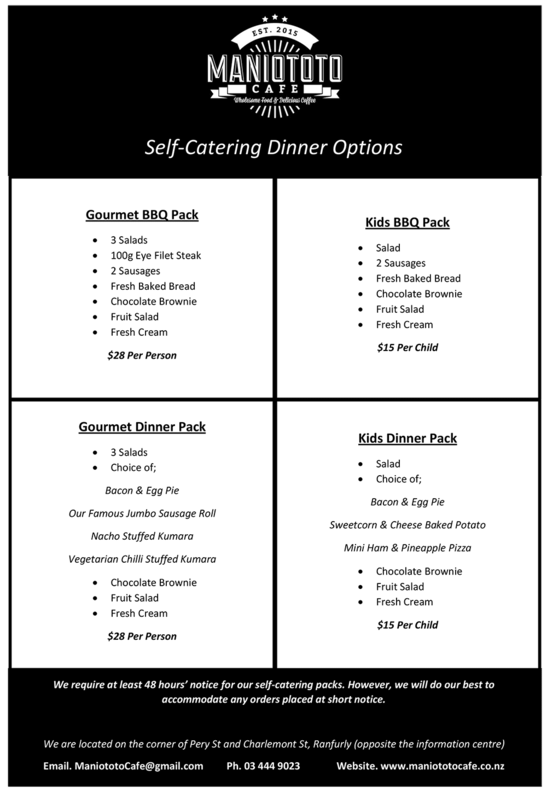 If you would like to order a meal from the Maniototo Café please put your choices in the comments/requests box when you are making your booking. After a busy day on the rail trail or at the conclusion of other recreational or business activities take time out and relax in our spa pool. Our spa room has a large (8 person) spa pool. The spa room opens out to a pleasant courtyard. The Hawkdun Room can comfortably accommodate up to 14 people and can be configured to meet any requirements. A 42” TV can be used to show presentations and videos to the audience and a white board is also available.